S199D 2nd and 3rd bleeds recognise HA-SGK1 more strongly then anti-HA antibody does. Does not strongly recognise the related isforms SGK2 and SGK3. 1 bleed does not IP : S199D S199D S199D anti-HA recognise over-expressed SGK1. 1st bleeddoes not IP : S199D S199D S199D anti-HA recognise over-expressed SGK1. 1st bleed does not recognise over-expressed SGK1. 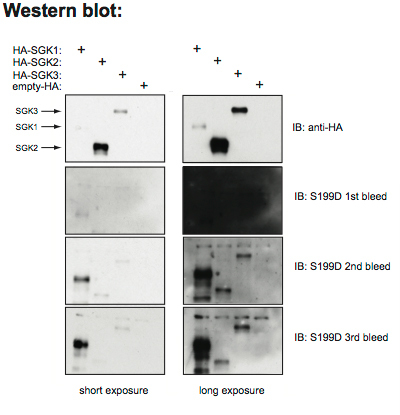 S199D 2nd and 3rd bleeds IP HA-SGK1, HA-SGK2 and HA-SGK3 as well as anti-HA antibody does. 1st bleed IPs HA-SGK1 vey weakly. Crossreacts with other SGK isoforms.